!!! based on excellent Arno's DLL !!! - Processing of batch files. - support "Area_*********" bmp or tga file from FsearthTile and "xxxxxxxxxxx.Su.bmp" from FS2004, !! At that time the Picture must have LOD13 width !! - The algorithm can be adapted to 10 profiles based on a personnal "brightness" value of picture. - A special algorithm (filter 1) * detection of vegetation was coupled with the detection of the brightness function like AgenT(filter 2) . 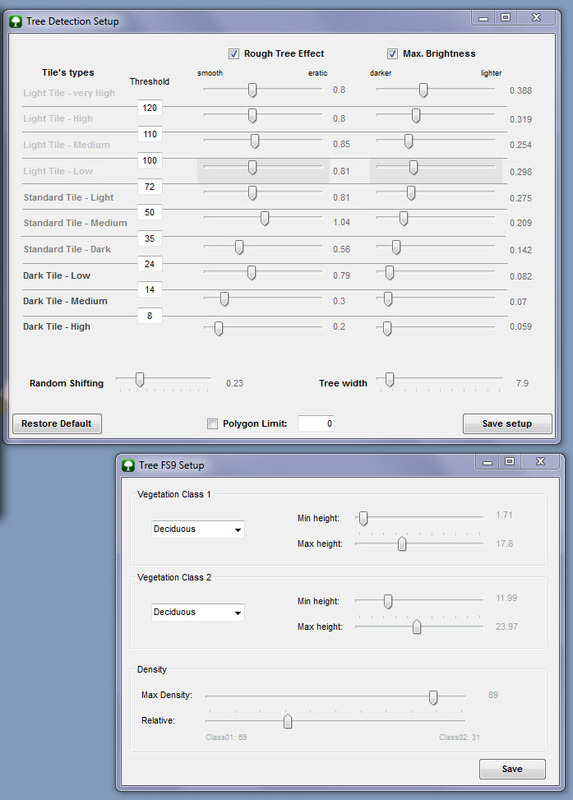 - Possibility to change the settings of those two algorithms. * Algorithm to differentiate plain area (field) of "rough" area (bushes, trees). I arbitrarily defined ten category based on an almost average brightness of the image. It is possible to set thresholds and transitions between two categories. For each category it is possible to set both maximum values ​​of the two algorithms. Filter 1: "Rough", higher is the value, more "scrubby"/"Rough" must be the area to be validated. Filter 2: "brightness", smaller is the value, darker must be the area to be validated. - the default parameter of this tool are more adapted to work with picture of 1024x1024 resolution. adjustement are surely needed. - higher is the resolution, better is the detection, more time by frame is needed. - It work with 256x256 picture but you need to desactivate the "rouh" filter to work with. Thanks for the tool, looks interesting. Like I told you in the pm I have been experimenting with vegetation detection a bit as well recently. My scenery is for fsx, so I don't have texture tiles to feed through your tool though. But the way you describe the algorithm sounds interesting. Hmmm ... would be interesting if this could be fed a Geotiff, or similar. I must say Vogel: Amazing work! Looks like I'll be redoing my autogen soon! Information on algorithm: the "rough" filter is based on something I've found when I watched the Color Histogram of a little "Tree" box compared to a little "field" box with photoshop. The first one have a larger base("eroded mountain", cause of wider range of brightness) compared to the second wich have a smaller base ("sharp moutain", smaller range of brightness).I compare just the range of green color(0->255) between min_value and max_value. If you begin to support GeoTIFF, would it be possible to additionally read from a near infrared band to help determine vegetation location? 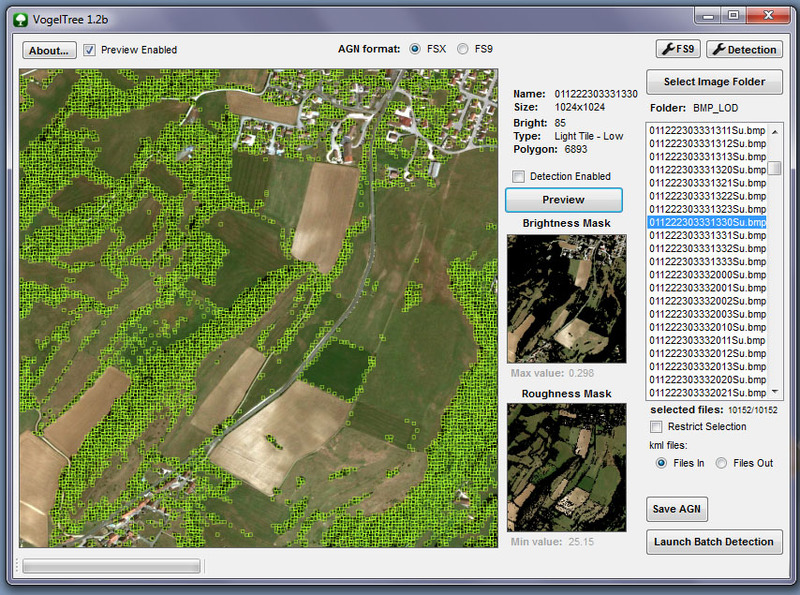 Much of the freely available NAIP imagery has NIR data in the 4th channel. first I will try to support GeoTiff I don't know if I can (hard to manage projection)... but infra-red reading seems to be a good idea. I have been experimenting with GeoTIFF in the past already. So I might be able to help with that. And I would be willing to put similar functionality in scenProc as well. So maybe we can work together on that. Oh ! great... I will PM you. I tried to start you programm and it crashed.. I dont see any gui, it just crash. I tried it on other PCs same problem. Also other language dosn`t work. I looked in the readme and if I understand it right there is nothing to configure, is that right? Hummmm !? Hi xflash, what is your system (xp,seven)? No error message ? Do you have framework 4 installed ? Oh sorry forgot it.. Win7 32/64 and Windows 2012 Server.. .net 4.0 is installed. Hi Vogel.. That was the problem. I use an english Windows with german regio setting.. It seemed i forgot it to switch..
- Bug of "Area ..... bmp" file management fixed. - The masks are now represented by only black & white picture. - The Tile's Type is being henceforth also highlighted when pressing "preview"
! Sorry but not support of Geotiff yet ! - Left-click on the cursor set, then use the left and right arrow keys to increase or decrease its value accurately. Looks like a very useful tool, thank you. I played around a bit with the developer (trial) version in the past, it's a great tool for geospatial analysis. It's even possible to differ treetypes from (high resolution) aerial image analysis. A very mighty and expensive tool though but maybe you could learn from the algorythms.